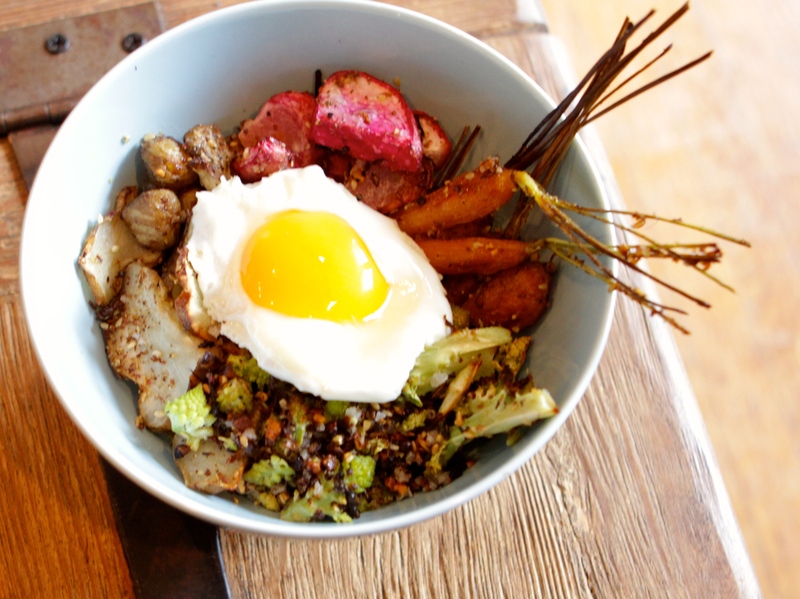 This veggie bowl is a constant in my life, I eat it at least a couple times a week for breakfast or lunch. The combinations are endless, I just used what was leftover from my weekly CSA from Johnson’s Backyard Garden. Top with a couple fried eggs, leftover quinoa, or shredded chicken to make it a meal. Choose vegetables with contrasting colors to make your bowl look appealing and cover a broad spectrum of phytonutrients! Dukkah is an Egyptian spice blend that is crazy versatile. You can change this up as well, depending on what you have on hand. Use whole spices so that you can toast them for maximum flavor. Save any leftovers to sprinkle on hard boiled eggs! Roast the almonds or hazelnuts in the oven at 350F until just fragrant, about 7 minutes. Grind the almonds or hazelnuts until they resemble small crumbs. Set aside. Toast the coriander, sesame, cumin, mustard and fennel seeds until fragrant in a skillet over medium heat. 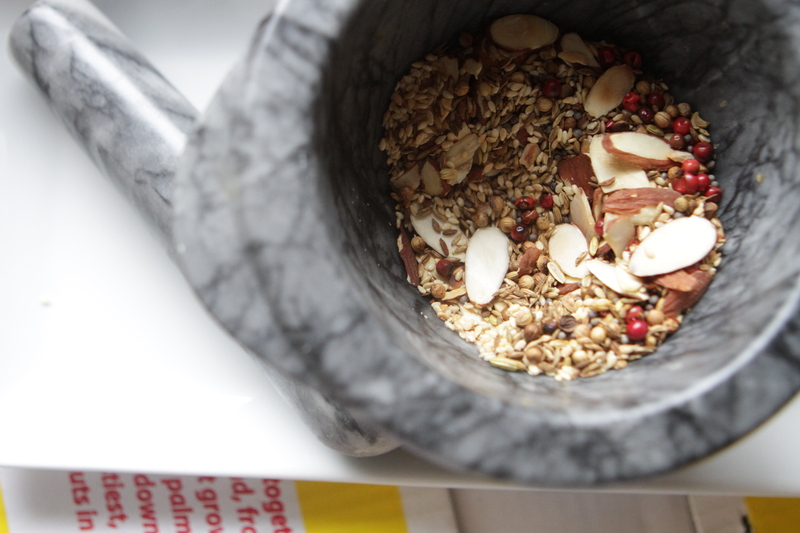 Add to a mortar and pestle along with the peppercorns and crush. Add the nuts and the sea salt. You can store leftovers for up to a month in a sealed container. Preheat the oven to 425F. Combine all of the vegetables in a large bowl and coat with ghee. Sprinkle liberally with about 1/4 cup of the dukkha. Roast 25-35 minutes until vegetables are soft-yet-crunchy. For those of you who’ve been missing my frequent posts, check out Ali Miller RD, where I’ll be posting original, food-as-medicine recipes twice a week!